Steiner doesn’t talk much about grade levels. Instead, he focuses on the child’s development at different stages. 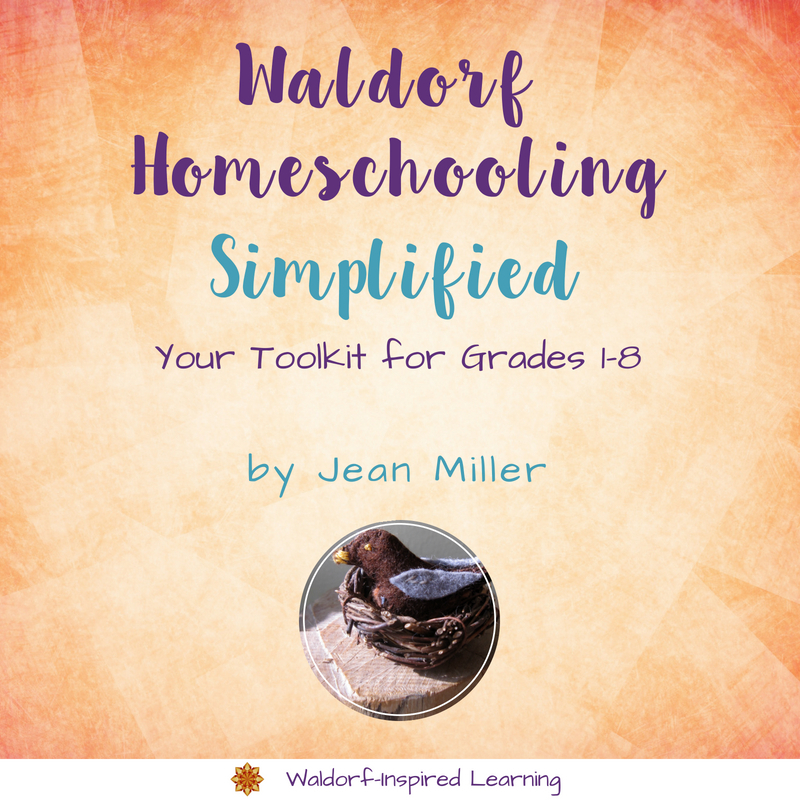 I think this is really great for us as we each design our own Waldorf curriculum for homeschoolers. This post is all about why. This lecture is found in Practical Advice to Teachers. Steiner goes on to delineate types of lessons for children before age nine, between ages 9-12, and after age 12. Here is his summary. Steiner then gives lots of examples: the human eye and nature’s laws of physics; the sequence of historical events and cultural life; a ball falling onto the floor and gravity; the miracle of Morse code. Ok, pause. Take a deep breath. Sometimes I get the feeling while reading Steiner that he says things that he assumes are so obvious! Well, not always. But his examples in this lecture are super helpful. Grasping his comments on this age-appropriate curriculum can take a few readings, I find. With my own children, I have experienced that Steiner’s developmental markers, such as sticking with stories about history until after age twelve, have been so spot on. Then the “aha” moment comes. If you haven’t gotten there with your children yet, you just have to go on faith with this! Some of those first teachers probably had to do this too!!! After the developmental-appropriateness of this curriculum, here’s the next most important part. As Steiner speaks about the Morse code example as a way of teaching about circuits, he says that we want to look for our own wonder in a subject so that we can teacher from there. We want to transform our adult understanding of a subject into something that is childlike, but not childish. This lecture gives great examples of how our goal as teachers is to aim for awe and wonder. Here are a few other key points that Steiner makes in this lecture. As a teacher, we are a poet, an artist if we can always relive in ourselves the activity of the child with our maturer humanity. To be forever a steady fellow is not a suitable mood of life for a teacher. You want to speak about life and nature in such a way that you take as much pleasure in it as the children themselves and are as much amazed as the children. A great deal depends on the atmosphere created between teacher and pupil. 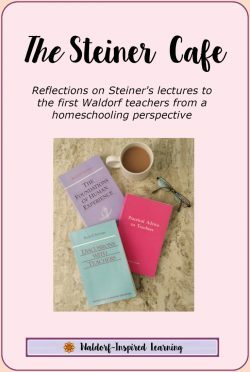 I am writing these reflections in the midst of a week of many conversations about what implementing the Waldorf curriculum at home looks like. 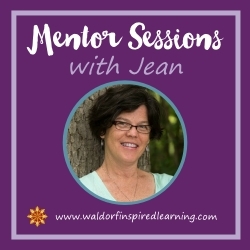 My mentor and partner in the summer Taproot Teacher Training for Waldorf homeschoolers, Barbara Dewey and I have decided to divide up our main lesson groups at next summer’s training in the ways described in this lecture rather than by grade. 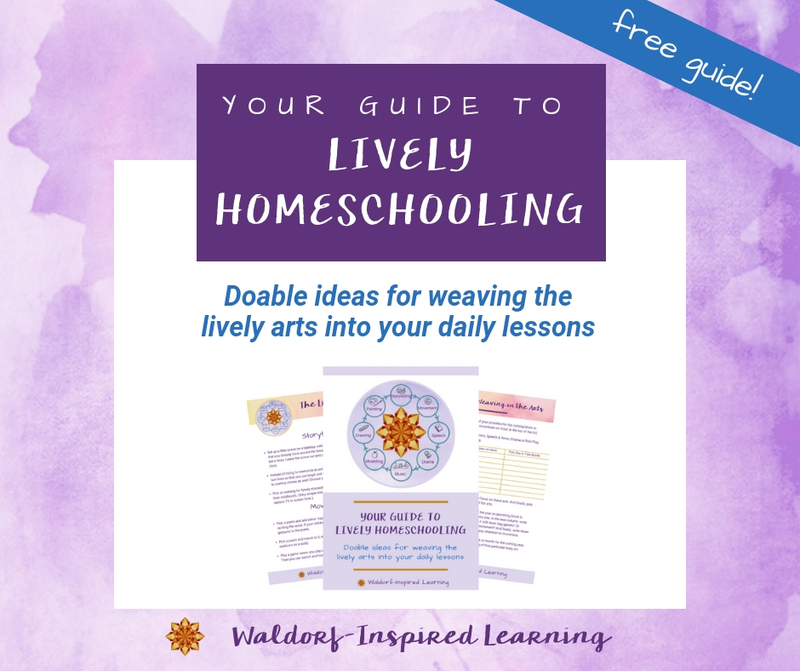 I also highly recommend reading this post by Carrie over at The Parenting Passageway, Peaceful Times in Homeschooling a Big Family. I think this applies to families of all sizes! Steiner really intended for his teachers-in-training to take these developmental principals he describes and work out their own curriculum from there. 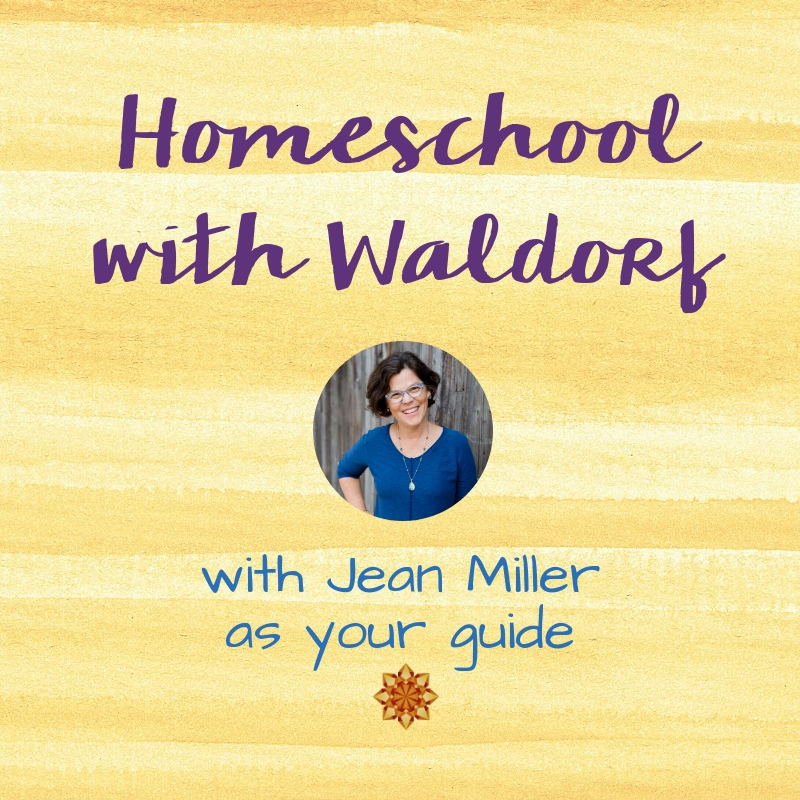 There is no such thing as a fixed Waldorf curriculum, or knowing exactly what to do! (I would posit that this holds true for all education.) We each work this out for ourselves, based on the children before us and an understanding of Steiner’s principles of child development. Our key task is to find the wonder in ourselves! I just love how pragmatic Steiner is. After all, he was giving these lectures to twelve individuals, only one of whom had ever taught before, in order to prepare them to open a school seven days from the time of this lecture! Are you ready? We can do this! Thank you for continuing this conversation about developmental stages rather than grades. I love the idea that blocks can be brought to a range of age groups rather than a fixed, set-in-stone, only-one-right-way curriculum. However, at the same time I have seen for myself the magic of how Steiner’s indications have been just right for my child at a certain age. So, I want to open up that can of worms that is the great debate about what Steiner means when he says “ninth year” “twelfth year” etc. With some folk arguing very passionately that “twelfth year” means age 11 and others that it means age 12, and with a pedagogy where developmental stages are seen as the driving force, it would seem to be a very important thing to be absolutely clear about. After all, there is a big difference in a child of 6 and a child of 7. I know where I stand on this debate, yet if we can’t agree on that one thing discussion of everything else is ambiguous too. One of the areas I would like to see discussed more is individual differences. Not all children develop in that “average-child” way (possibly none of them do…) and to make decisions based upon a child’s age rather than a child’s individual stage of development in a range of areas seems blinkered at best and dogmatic at worst. Then there are gender differences to consider – should we expect our boys and our girls to be able to attempt the same things at the same age? Some educationalists suggest there is a huge gap between academic abilities here, particularly around school starting age of six or seven. That boys are not just a bit behind but years behind their female peers and that it takes several years for them to catch up. Should we chip away like the practice-makes-perfect camp (sometimes described as developing the will) or should we patiently wait for the fruit to be ripe? if my 11 year old is like a 14 year old in some ways, a 9 year old in others, and the average 11 year old for most of the time, plus we are on the cusp of the 12 year change, what are the most important things to take into consideration when deciding which blocks we need to be doing “right now” and which blocks can wait? And if we take our time over the lower grades, what happens when we do hit one of those developmental milestones – do we just drop what we’re doing, skip some of the lower grade blocks and dive straight into the 12+ selection? Or does it mean there is a minimum age for certain blocks and no upper limit? At what point is a block past it’s use-by date and should just be ignored? Is it really detrimental to his soul to get any of this wrong? I think this is a very interesting and important discussion. I really feel the need to break free from dogma. Whilst I have always made adjustments and never been able to follow a purchased curriculum exactly as it was written, I still have a whole heap of “shoulds” in my head that just don’t serve me and need to be unpacked and discarded. Discussions like this help. Thank you! Cathy, thanks for posing so many great questions! Makes me think about a quote by Rainer Maria Rilke about living some day into the answers. It’s not that it doesn’t really matter when we do what, but that it’s different for each child, as you point out, and each family constellation. Steiner does talk about the importance of individual differences; that’s why he lectures on the temperaments so much because this is a way of teaching to individual differences in a group. We are better suited to do that at home! You can read more about that in this post on Speech, Temperaments, and Misbehavior. I don’t think Steiner ever intended to be dogmatic. He was way too pragmatic for that. He gave two weeks of lectures and the school opened. Very freeing. And on the very first day of lectures he said, “If we take things concretely, we cannot endlessly pursue questions!” Check out that post here: Teaching is a Moral and Spiritual Task. So, we read a bit, observe and meditate on our children, decide on the blocks, and begin. Then we observe as we go and adjust. Not easy, but simple. Thanks for contributing to this important discussion! Nice post. I know I can get so caught up sometimes in the “structure” of Waldorf that reminders like this are so important. To relax, let go of curriculum and just teach to your child’s needs. Thanks, Jen. 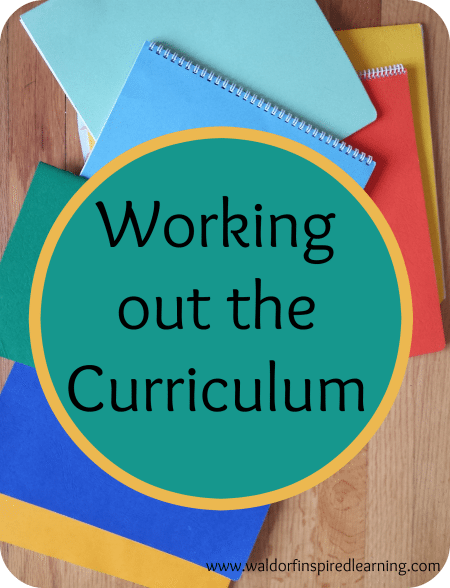 I find it’s important to know the curriculum and then do some contemplating on how to work it out for our particular children in our particular homes. Helps us to focus on the relationships and finding the joy! Jean you always make it sound so simple:) 13 year old boys are interesting:) Hugs!!! Thanks so much, Andrea! Ah yes, those 13 year old boys. Breathe deeply and take those hugs whenever you can get them! Our children really do grow up. And get real jobs. And even iron their own shirts! (Although I love that my oldest still comes over to use my ironing board and iron!) Hope you’re settling in nicely in your new abode. Thanks for your reply, Jean, and for bringing up the temperaments. When Carrie mentioned that in the earlier discussion on her blog it got me thinking. When I mentioned individual differences I was largely referring to cognitive and physical development, but temperament is also really important and something I’d like to explore more in terms of the homeschool setting. I hope my response to your post didn’t come across as argumentative or critical or confrontational because that certainly wasn’t the spirit in which I’m asking these questions. I think, for me, it always comes back to this: what is relevant for school may not be relevant for homeschool, but how do I figure that out because not everything is obvious from the start! 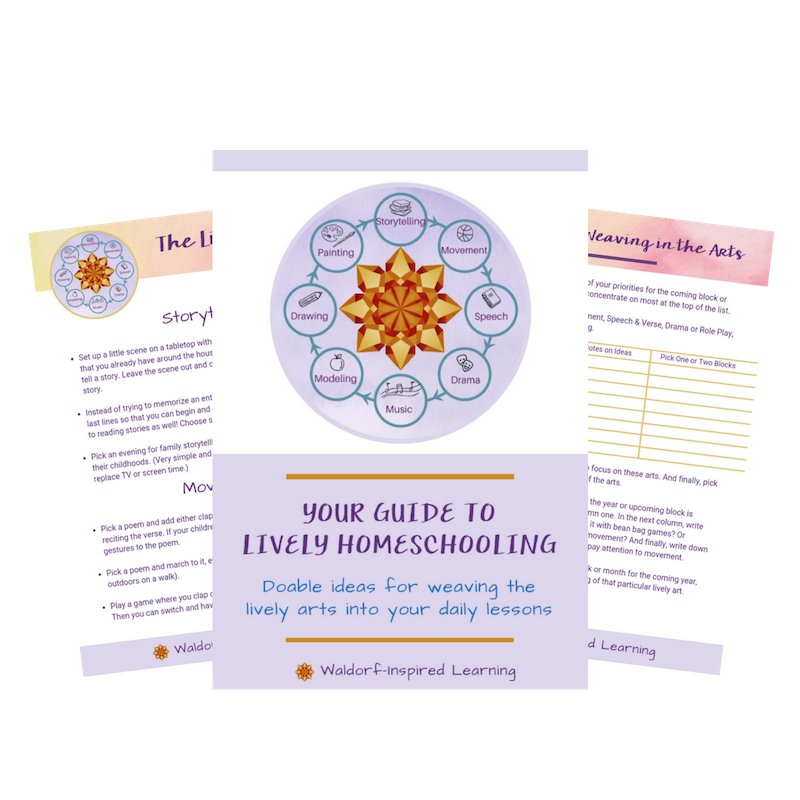 I believe that we are at a bit of a juncture in our lives, both developmentally and in terms of lifestyle and habits and that, in order to make homeschooling continue to work for us we have to make some changes. 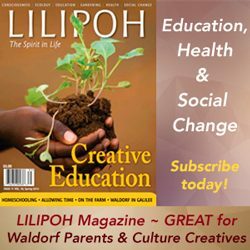 I still love the Waldorf curriculum but I know that we cannot continue to do things just as we did the last six years. 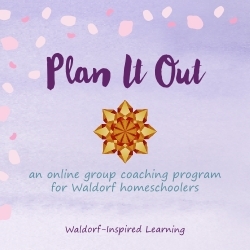 I feel that we changed to fit (my understanding of) Waldorf homeschooling and lost ourselves in the process, now I need to reclaim some of ourselves back. I don’t want to throw the baby out with the bathwater plus we have also changed (and continue to change), but I’m trying to work through lots of things at the moment and figure a way forward. I read somewhere that Steiner made a lot of compromises when setting up the first school and that the curriculum was not his ideal anyway. Would love to know what that ideal curriculum was, or what he would have to say about homeschooling when we have the freedom to make our own decisions and choices. Perhaps that’s another blog post (hint hint:-)). Oh, Cathy, I know that place of knowing “what is relevant for school may not be relevant for homeschool, but how do I figure that out because not everything is obvious from the start!” I see three important steps: see what Steiner had to say on the subject, see what’s done in Waldorf schools, and then observe your own children. Seems simple enough, but it’s not easy. I know. I like your suggestion to write more about the compromises of the first school because as you imply, I do think there are interesting gleanings for homeschoolers here. For one, Steiner felt we don’t need all day to teach and learn! The forum is not active at this point because I am working on a new set up for group work. 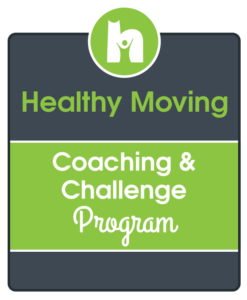 Look for my new Mentor Groups starting in June. Thanks for being here Cathy; you always raise important questions and I really appreciate that!